Aloha, all! 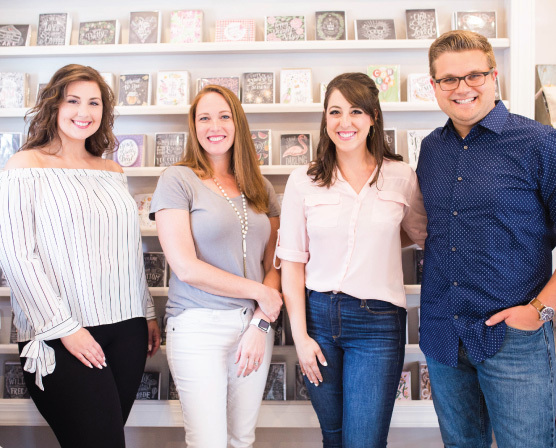 🙂 The Lily & Val team is always so honored and grateful when friends near and far come to visit us at our brick and mortar store in Pittsburgh! For our friends that cannot visit in person, we wanted to give you a virtual tour around the Lily & Val Flagship Store instead! The store changes around quite often, but this is our current, summer look filled with tropical vibes! The Lily & Val Print Bar (above) is where we offer every L&V print with framing options. Customers can sit at the bar and flip through our “Print Bar Menus” to find the perfect design for them. In addition to our own L&V products, we stock the store with handmade goods from some of our favorite vendors, one-of-a-kind vintage finds, repurposed furniture, and items we love! I love our current tropical leaf themed mantel! Part of me never wants it to change! Our Chalk Lettering table! All copies of The Complete Book of Chalk Lettering available in the store are signed! We also have our Chalk Lettering Tool Kit and new Lily & Val stencils! Thanks for joining this little virtual tour! It is still so surreal to me to have this store and the amazing team that we do. I will be honest to say that running a small business is not easy. There’s a lot of ups, downs and everything in between, but the truth is, I wouldn’t change anything. You all make what we do so worthwhile and it humbles me everyday. Thank you from the bottom of my heart for your continued support, friends. We hope to see you in person! For more Pittsburgh Flagship Store info and workshops, click here. Thank you to Lindsey Zern Photography for the beautiful photos!